This is less a step-by-step tutorial than it is inspiration. You know me, I have lots of T Shirts around and I hate getting rid of them. Thankfully, I have a 13-year-old boy whose whims change as fast as he is growing. Some time ago, I bought some foam from Joann’s to make floor cushions for the kids to use up in our loft. The idea was that they could use them L-shaped as a mini seat, or throw them on the floor to sit on. I covered them in some home dec fabric. I didn’t do the greatest job, as you can see by the sagginess. As life will have it, the cushions were used little, except, perhaps, as projectiles, and got moved to the basement. I got tired of looking at them and decided to repurpose them for use in my son’s room. Now, my son’s room is 10′ x 10′, if that. It was an adorable little baby room for years. When my older son became a teen, we decided to move him out of his sisters’ room and bring him back to this room. It is very hard to develop a functional floor plan with such a small room, so we opted for a lofted bed with a desk and bookshelf underneath. It served him well until we expanded our house. Now my 13-year-old has it. He had the loft for quite some time but then it started to feel like a cave. After a while, the desk under the bed becomes too small, so we worked on a new floor plan. We disassembled the lofted bed and placed it on the floor. I thought he might enjoy having it feel like a sofa and came up with a plan to use the cushions and cover them with T Shirts from his favorite college! I’m not sure I’m ready to transform his “camo” room to a Notre Dame room yet. We’ve also talked about a sailing room….or sports….as you’ll see, there’s a bit of all of that! I removed the old fabric covering and determined the height that I wanted the cushions, which, as you can see are 6″ thick. Mark the cushion. I made mine 16″ high. My second piece of foam was 7″ thick, so I also trimmed that down. That was very difficult, but I put the uneven side to the back. Next, I gathered my T Shirts. My son selected the ones he wanted to use. (Yes, we have THAT many in our attic!) I laid them out across the foam to determine how many I would need. I cut my T Shirts an inch longer than the foam to accommodate 1/2″ seam allowances. Once I had the front pieces measured and centered on the foam. I added plain T Shirt fabric from the backs of the shirt to create a tube that fit around the foam. The T Shirts stretch, which can make it a little difficult to sew. A serger works great – or a stretch stitch or zig zag stitch on your regular machine. But the stretch also gives you wiggle room so your measurements don’t have to be perfect. I simply added fabric until I had enough to go around and sewed the last seam. I tried on the tube to determine that it was a good fit. For the top and bottom rectangles I used smaller motifs. I even added part of a sleeve motif. Again, measure the size of the rectangle and add an inch all around. Because I didn’t align the shirts to the corners, I didn’t have an easy way to pin the rectangle. In these cases, I determine the center point of everything, pin that point, and then line up the pins. So I matched the center of the top rectangle to the center of the larger upholstered piece. I pinned around, clipped the corners and stitched. You have to be careful not to get the fabric caught at the corners. I did the same with the bottom, but left one side unstitched. I made sure to go around all four corners and stop just past the corner so it would be easier to hand sew closed. That’s it! Simply hand sew the opening closed with a slip stich. I made these fairly quickly. When it’s just for your son’s bedroom, you don’t have to be fussy! Here it is on his bed. (We reversed the camo comforter so that there’s not too much busy-ness going on.) Can you see the T Shirt Pillow in the corner? I have a tutorial for that, too! Some day he will get a proper bed….these types of beds are a pain to keep the covers on. I have yet to invent something to aid in this. Back when the kids had bunks, I would cut and sew elastic to the corners to make tailored edges. It’s so hard to make bunk beds! Did I mention we have a few footballs? That’s a photo of my dad when he was in the Navy. He served on Iwo Jima and is the inspiration for my son’s fascination with all things military and World War II history. Just one of the model planes hanging from the ceiling. 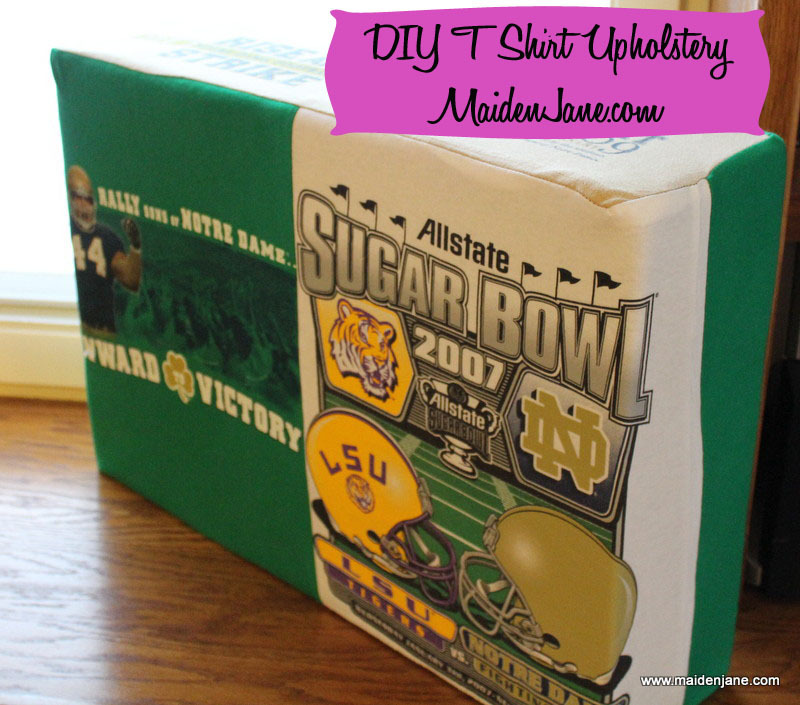 I hope you will be inspired to find a new use for your old, favorite T Shirts! Feel free to ask me any questions! This is such a wonderful idea!! Thanks for sharing! I found your Blog yesterday ,as I used Google for finding some Mug Rug Inspirations and I fall in love with your Work.In these morning ( I live in Hamburg ,North Germany ) I looked a bit more into your Projects and I have to say that you are wonderful.I so hope to see so much more from you . I wish you and your family a wonderful Christmas .